If a piece of ice will gain a subroutine from an effect like Sensei or Komainu, does that subroutine factor into the additional cost for Hernando Cortez as well? No. Those effects cause the next piece of ice encountered to gain a subroutine, but ice is rezzed during the approach. 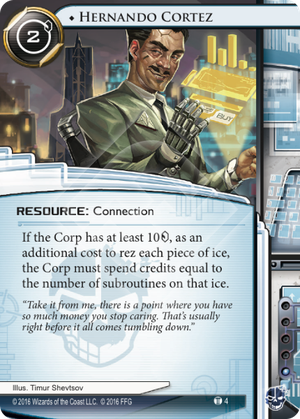 How many credits is the additional cost incurred for rezzing a piece of ice with flexible subroutines while Hernando Cortez's ability is active (such as NEXT Silver, Ashigaru, Tour Guide, etc.)? The abilities that cause these pieces of ice to gain/lose subroutines are only active once the pieces of ice have been successfully rezzed. Because costs are always paid before the rez, Hernando Cortez will not add an additional cost to these pieces of ice. Easily the Answer to Sandburg the designer of the Cortez Chip makes it even more fun for the Corp to rez ICE. Want that Ichi 1.0 up? Thats a 7 credit cost. Want to get up the NEXT Silver up with 2 other NEXT ICE online? thats now 5 credits... Its essentially forces any Corp to make sure they have 2-4 credits more to protect servers and makes the corps math go out the window. Excellent card.